Magnetic Reconnection is a phenomenon in plasma physics where magnetic field lines, normally coupled to the motion of the plasma due to the ‘frozen in’ condition, change topology i.e. touch and reconnect (see Fig. 1 (a)). This happens in regions of the plasma where the magnetic Reynolds number is low (i.e. Rm<1), known as diffusion regions. It is an important effect in solar physics since it can lead to a fast release of magnetic energy and is thus used in many models of eruptive events such as solar flares and coronal mass ejections, for example Hirayama’s model of solar flares (see Fig. 1 (b)). In this model it can be seen that, while reconnection along a prominence leads to the expulsion of a plasmoid, the prominence itself provides a perpendicular magnetic field component i.e. a guide-field. 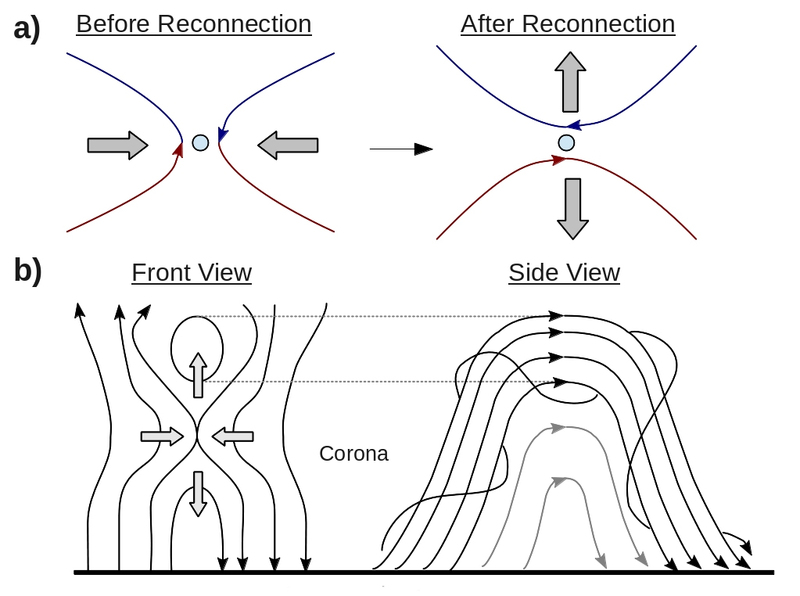 Furthermore we note that, in this model, magnetic field lines are free to move at the top of of the corona but are tethered in place at the photosphere. These scenarios constitute boundary conditions, which is also a factor addressed in this research. Figure 1. a) The process of magnetic reconnection, showing two reconnecting field lines, with the circle at the centre representing the diffusion region. b) Hirayama’s model of solar flares, adopted from , showing how a rising prominence (side view) drags out opposing field lines (front view), leading to reconnection and the formation of an X-point. Reconnection models are the subject of many simulation studies using MHD, Hall MHD, Hybrid or Particle in Cell (PIC) codes. The latter of these (PIC codes) are the most recent addition to the field and are useful since all the physical aspects relating to magnetic reconnection are taken into account. Many simulation set-ups for reconnection, including many based on the tearing-mode instability (see  chapter 6), yield the same reconnection rate in several codes. However X-point collapse (see  chapter 7.1) is highly dependant on the inclusion of pressure terms and thus the consideration of kinetic effects is vital, and employed here with a PIC code. 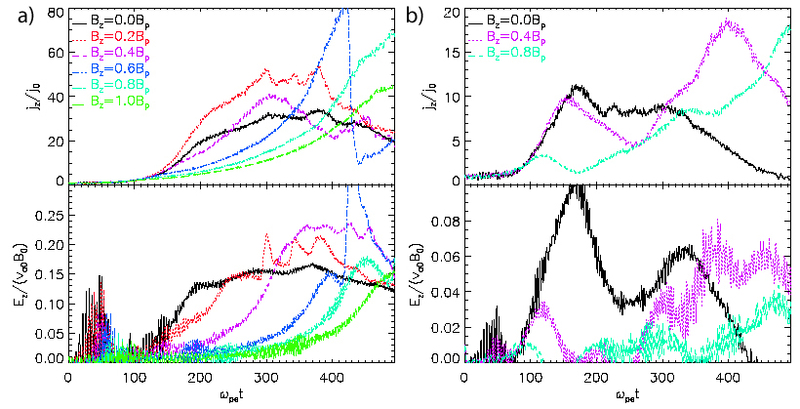 The research presented in this nugget  is an extension of the works of [1,2], where collisionless magnetic reconnection in a stressed X-point collapse was investigated using a 2.5D PIC code (i.e. a PIC code over a domain with two spatial dimensions and three particle velocity components). The same set-up was used in this simulation, also including ‘closed’ boundary conditions, where particles are reflected at the boundary and magnetic flux is conserved, fixing magnetic field lines. The alternative boundary conditions introduced here are ‘open’ i.e. allowing particles and magnetic flux to escape at the boundary. Further, a uniform out-of-plane magnetic field (guide-field), ranging from 0.1 to 1 the characteristic in-plane field strength (BP), was introduced. The video below in Figure 2 shows the initial set-up and the evolution of the in-plane magnetic field over the full simulation domain for the open and the closed boundary case for zero guide-field. The tethering of the field lines to the simulation boundary can clearly be seen in the closed case. Also it is apparent that the reconnection rate is significantly greater in the open boundary case. As shown, the closed case does not allow for a significant thinning of the central region, indicative of a lesser development of a current sheet. Figure 2: Video of the evolution of the in-plane magnetic field for open (left) and closed (right) boundary case. The out-of-plane electric field at the X-point (i.e. the point where the field lines connect) is representative of the reconnection rate. A great reconnection rate points to a quick release of magnetic energy and is thus of interest in reconnection studies. Further, as X-point reconnection is linked to the formation of a current sheet, the magnitude of the out-of-plane current (reconnection current) is also of relevance. Both of these quantities, for varying strengths of guide-field, are plotted in Figure 3 for both boundary cases. It can be seen that the reconnection rate in the open case generally exceeds that in the closed case. The closed case follows a characteristic two peak structure. In the open-case the onset of reconnection appears to be delayed for greater guide fields. Similarly, in the closed case, amplitudes of the initial peak in reconnection rate are heavily suppressed. Similar observations were made in , where it was postulated the reduction in reconnection is due to the increasingly restrained meandering motion of electrons due to increased guide-field. However, in the open case it can be seen that the reconnection current actually increases for a guide-field of 0.2BP. A closer analysis determined that a maximum reconnection current can be generated between 0.1 and 0.2BP. Note worthy in the open case are also the extreme peaks in the 0.6BP guide-field case in both reconnection rate and reconnection current. It was shown that this was linked to the emergence of an electron vortex at the X-point. Figure 3:. Out-of-plane current and electric field at the X-point, indicative of the current sheet strength and the reconnection rate respectively for guide-fields ranging from 0 to 0.8 of the characteristic in-plane magnetic field, for the open boundary case (a) and the closed boundary case (b). By looking closely at the motion of electrons for high guide-fields in the open boundary case, when peaks in reconnection current occurred, it was shown that electron vortices emerged at the X-point, most pronounced in the 0.8BP guide-field case (see left panel of Figure 4). These were also linked to the formation of magnetic islands, making them similar to vortices observed in . It is to be noted however that this is in fact the first discovery of vortices in X-point collapse. As shown in Figure 3, in the beginning of the simulation, in all cases, oscillations in the out-of-plane electric field at the X-point are observed. These appear to be at the centre of an emerging wave pattern, as shown in the right panel of Figure 4. Using a 2D Fourier transform analysis it was shown that the main power of the wave seems to lie in the ordinary branch at a frequency corresponding to the upper-hybrid frequency. This is of interest because this matches signatures of solar radio burst radiation patterns as modelled in . Figure 4: (Left) The vortical motions of electrons around the X-point for high guide field in the open case, superimposed on the out-of-plane magnetic field at the X-point. (Right) The wave pattern in the out-of-plane electric field at the beginning of the simulation in the open case for zero guide-field. Arrows indicate the direction of the Poynting vector and thus the direction of wave motion. Reconnection rates were found to be generally higher for the open case and for lower guide fields. Greater guide fields delayed initial on-set times in the open case and reduced initial amplitudes in the closed case, which is consistent with . However, reconnection currents in the open case were shown to increase and have an ‘optimal value’ for guide-fields between 0.1 and 0.2BP. Singular vortices were shown to emerge at the X-point in high guide-field cases (> 0.6BP). They are linked to the formation of magnetic islands and are thus comparable to vortices observed in . This is however the first discovery of vortex formation in X-point collapse. Electromagnetic waves are generated at the beginning of the simulation. These were shown to be similar to solar radio burst signatures as modelled in  and may be of observational relevance. M. Aschwanden, Physics of the Solar Corona (2005), p. 437. E. Priest and T. Forbes, Magnetic reconnection: MHD theory and applications (2000). J. Graf von der Pahlen and D. Tsiklauri, arXiv link (Phys. Plasmas (2013) accepted). D. Tsiklauri and T. Haruki, Phys. of Plasmas, 14, 112905, (2007). D. Tsiklauri and T. Haruki, Phys. of Plasmas, 15, 102902 (2008). R. Horiuchi and T. Sato, J. Plasma Phys. 4, 277 (1997). R. L. Fermo, J. F. Drake, and M. Swisdak, Physical Review Letters 108, 255005 (2012). G. P. Chernov, Space Science Reviews 127, 195 (2006).